September 13th is Uncle Sam Day. Former President George W. Bush proclaimed Uncle Sam Day to be September 13, 1989, in honor of the anniversary of the birth of Samuel Wilson. The city of Troy, New York, requested the designation of Uncle Sam Day. It coincided with the bicentennial celebration of the city of Troy, New York, where Wilson lived and worked. The symbol of Uncle Sam was inspired by a real person. Samuel Wilson was a meat packer from Troy, New York. He worked as a butcher during the War of 1812. It has been said that he was a very likable fellow, and some felt as though he were family. The neighbors called Samuel Wilson “Uncle Sam”. Samuel Wilson won the right to supply beef to the American troops. Soldiers from Troy saw barrels of meet stamped with the initials “U.S.” They joked that it stood for “Uncle Sam” (instead of United States). People in the military, and civilians alike, started saying “Uncle Sam is feeding the troops.” A newspaper picked up the story – and this led to widespread acceptance for “Uncle Sam” as the nickname for the United States federal government. In the late 1860s and 1870s, a political cartoonist named Thomas Nast popularized the image of Uncle Sam. He gave Uncle Sam his white beard and stars-and-stripes suit. Thomas Nast was also the person credited with creating the modern image of Santa Claus. He also came up with the donkey as a symbol for the Democratic Party and the elephant as a symbol for the Republican Party. The image of Uncle Sam that was created by artist James Montgomery Flagg is the one most people think of today. Flagg gave Uncle Sam a tall top hat and a blue jacket. This version of Uncle Sam points directly at the viewer. In order to save the hassle of hiring a model, Flagg chose to use himself as the face of Uncle Sam. Flagg’s image of Uncle Sam was used as the cover of Leslie’s Weekly in July of 1916, with the title “What Are You Doing for Preparedness?” During World War I, this version of Uncle Sam was used as a recruiting poster. The words “I Want You For The U.S. Army” were printed on the poster. 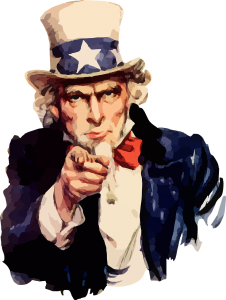 The same image of Uncle Sam was used on posters during World War II.